There’s a good chance you’re reading this blog post on your smartphone. We’ve been observing the signs of a major shift towards mobile browsing for a while, but it looks like 2015 is the year the mobile trend will start to have a serious impact on the way brands design their online properties. Remember ‘Mobilegeddon’? Discussion and anxiety around this trend recently reached a fever pitch when Google announced a mobile-friendly update to its search algorithm, which decreases the SERP (search engine results page) ranking of pages deemed not mobile-friendly. Along with some mild panic and smug I-told-you-so’s from industry experts, Mobilegeddon caused many digital marketers to stop and consider the implications of the long-term shift of browsing habits from desktop to mobile. So how mobile do websites have to be in order to please Google’s algorithms? And why is it so important in the first place? If your brand is going to survive (and thrive) in a post-Mobilegeddon world, you need to know the facts. Google’s algorithm update is only applicable to mobile Google searches. This means no searches from desktops or tablets will be affected. To see how pressing the need to make the mobile transition is for your business, find out how your audience accesses your website. If you know which devices the majority of your demographics use, and mobile doesn’t contribute to a big portion of your traffic, you might be able to hold off on the redesign. In the US, the “smartphone-dependent” population is on the rise. 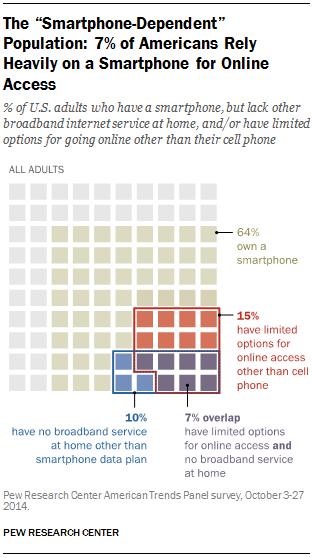 According to the latest report from Pew Research, smartphones and a cellular network are the only means of going online for 10% of Americans. Think about the implications of that: a tenth of the overall population of surveyed American Internet users don’t ever use a desktop computer for online access. While this still leaves a significant number of desktop users, it shows the change in user habits big enough to cut laptops or desktop computers completely out of the picture. Think about the last time you went on vacation or a business trip and only used your smartphone to finish off your work. Google’s algorithm adjustment also signals that enough searches happen on mobile to make this a serious factor in SERP—as a matter of fact, SearchEngineLand recently reported that more Google searches happen on mobile than desktop in over 10 countries, including US and Japan. So even if your audience isn’t getting to your site through smartphones yet, expect to see a change in that soon. In the meantime, you can check how your website measures up using the Mobile-Friendly Test. Google developers have provided all the necessary resources to check if your individual pages or entire site are mobile-friendly. You can find links to these tools on Google’s Webmaster community blog. 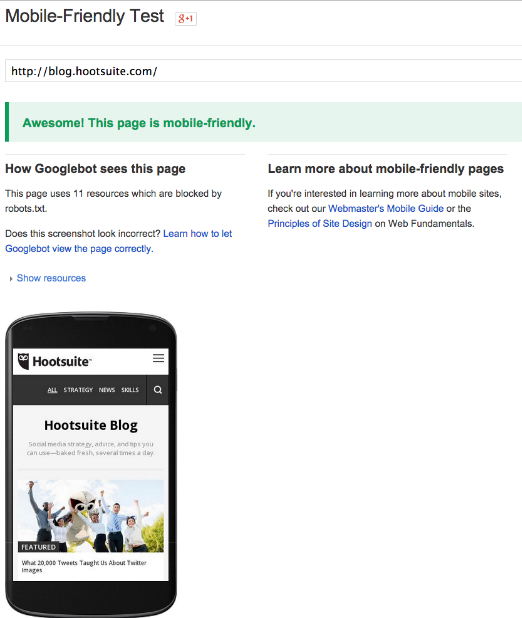 Before you start plugging in your domain name, however, consider what Google considers to be mobile-friendly. “Mobile-friendly” to Google means that users don’t have to zoom in to read your content, your links are nicely tappable, and your page requires minimal horizontal scrolling. Pretty straightforward: Google cares about user experience when ranking search query results, and they want the top results to be easy to read. If you haven’t optimized your website to be more mobile-friendly, you can help Google reevaluate its ranking of your page once you’ve made those changes. In the official announcement, Google developers did promise a decrease in referral traffic from the search engine for those websites that have not adjusted their design to be more mobile-friendly. According to TechCrunch, nearly half of Fortune 500 companies would fall victim to Google’s penalty unless they undergo a redesign in the near future (the algorithm change itself kicked in on April 21, so all businesses have had a couple of weeks to make things right). 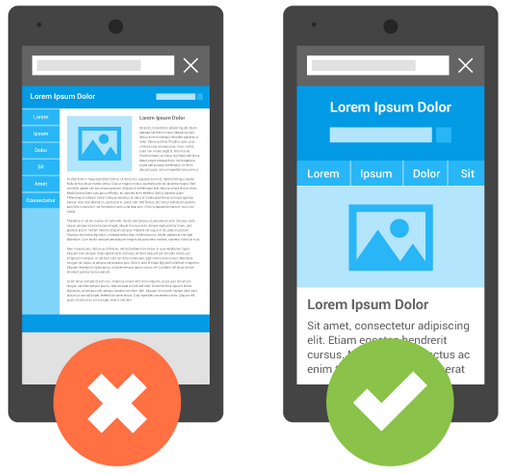 If your website got the dreaded red ‘X’ on the Mobile-Friendly Test, don’t worry—Google will automatically “recrawl” and re-classify your website once you have made the necessary changes for smartphone users. If you want to speed up the process, developers recommend using Fetch as Google with Submit to Index in order to get the mobile-friendly treatment sooner. Finally, if your business is hiring, you should probably consider going mobile sooner. Forty-three percent of adults surveyed by Pew Research have used their smartphones to look for jobs, and 18% of them have submitted a job application on a mobile site. You don’t want to miss out on talented candidates because they were among the first to jump on the smartphone browsing trend. If the site-wide overhaul takes too long and your hiring process needs immediate attention, you can start by making your careers page mobile-friendly. So if you’ve been afraid of the smartphone shift, fear not: Google’s latest algorithm change is only a much-needed push in the direction dictated by our own online behaviours.